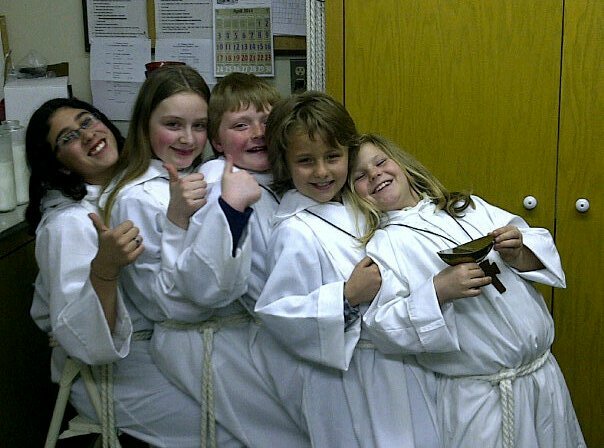 At the Great Vigil of Easter this year, one of our youngest acolytes graduated from boat-bearer to crucifer. The Great Vigil, as I’m sure you know, is one of the most complicated services of the Church Year. Everything’s backwards! The crucifer doesn’t go first; the deacon does. The torches don’t follow the crucifer; they follow the Paschal Candle. The altar party doesn’t sit up in the sanctuary; they sit in the front pews. However, she wasn’t nervous at all. Our acolyte master was right behind her during the entire service, giving her gentle guidance about where to go next and reassuring her that she was doing a great job. This entry was posted in Daily Office and tagged acolyte, crucifer, Great Vigil of Easter, Isaiah on April 2, 2013 by Rodger Patience. St. Thomas is blessed that you are our Deacon! Thank you for all you do Rodger. This is so important for these kids!